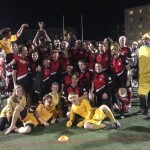 McGill wins the Canada Cup … again! 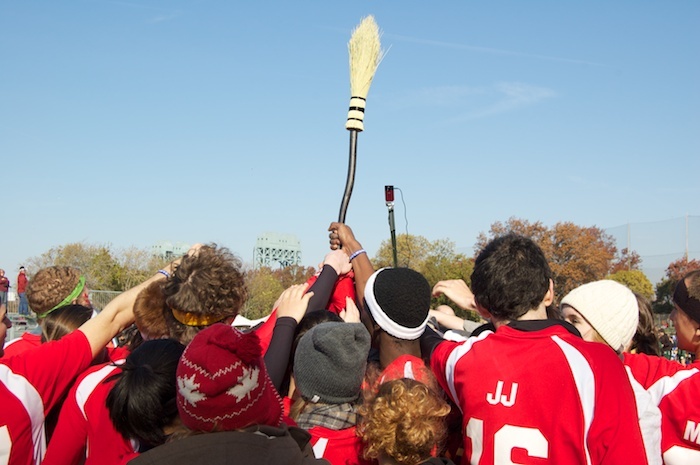 For the second year in a row, McGill University left the Canada Cup as the national champions in the sport of quidditch. For the record, there have only ever been 2 Canada Cups. There were some really intense and close games—ones that were too close to call until the final snitch grab—which made them very exciting to watch. 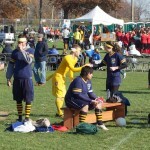 I went to the Cup this year as one of the golden snitches. This tournament was remarkable for a couple reasons. First off, it was very well organised. I can honestly say that I haven’t been to any tournament that was better-run than this one. The weather was ideal: brisk and sunny. The grounds were perfect for off-field snitching: a million places to hide. It was great. Also, there were about a million snitches, too. 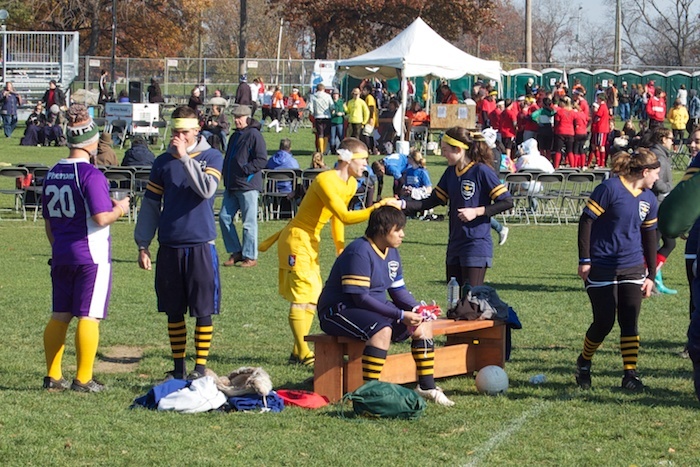 Almost every quidditch tournament I’ve been to has been lacking in snitches, and this one had an overabundance. 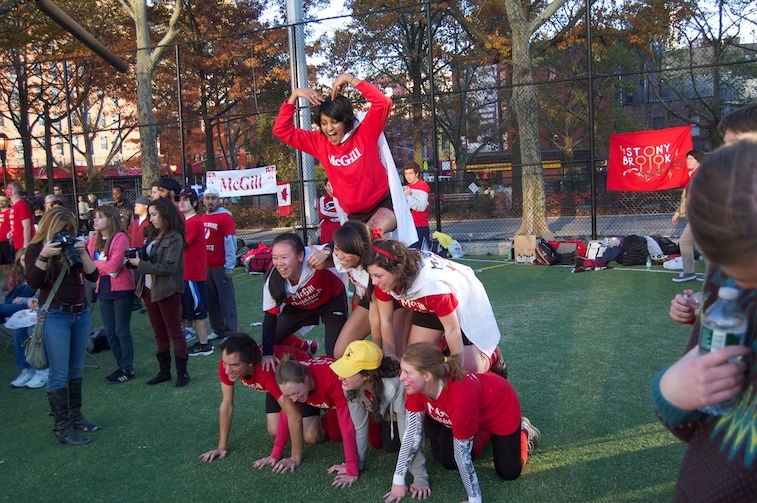 The consolation match ended up going later than the final match, and I enlisted some of my McGill snitch friends to engage in some on-field mischief. 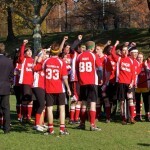 When I came back to the field, the score was 30-0, which meant that the snitch-catch tied the game. It’s sometimes said in quidditch that the only player who’s guaranteed to lose every match is the golden snitch. Tonight I made history, because the only possible exception is that of a tied game: When a game is tied, it goes into overtime in which the snitch does not leave the field, and at the end, the team with the most points wins. Overtime ends after a period of 5 minutes or by a snitch-catch. The five-minutes of overtime came and went, and by the end of it, I hadn’t been caught. 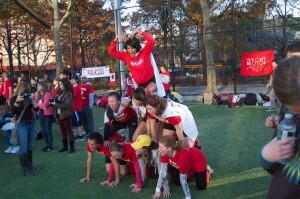 Carleton, the team that won, hoisted me up on their shoulders. I won the game! 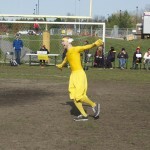 As the golden snitch! This almost never happens. 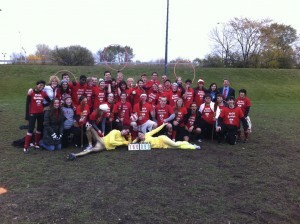 It was the perfect conclusion to a fantastic tournament: my team won (congrats McGill!) and I won too! I discovered last week that the Carlisle-Desroches Quidditch Hoop Construction Manual was incorporated into the latest version of the IQA rulebook! Hooray! We never received any official notice from the IQA—we found out about this when one of my teammates noticed a reference to the design on the IQA site. Anyway, we’re honoured, and this has inspired us to put some more work into it. 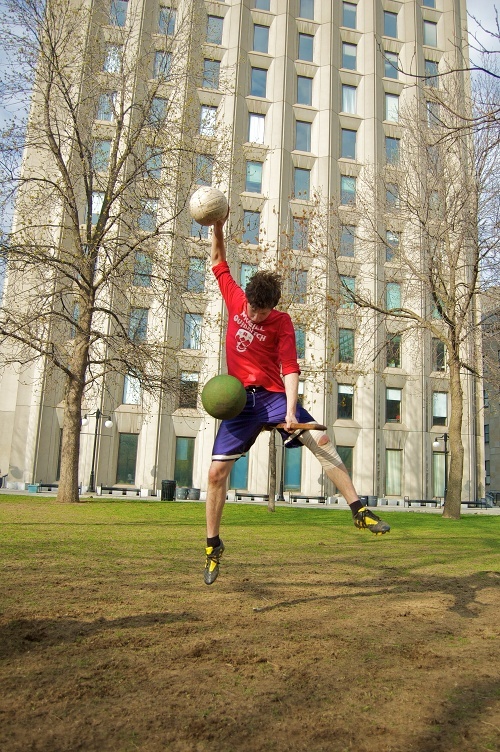 Also, one of the members of the McGill Quidditch team has asked us to re-think the bases for the hoops this summer. 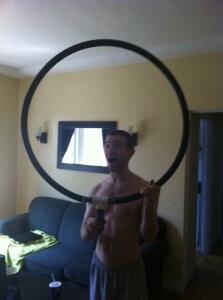 Hence, we plan to build, test and release the Mark II Carlisle-Desroches Quidditch Hoop over the course of the summer. 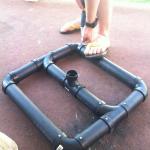 The new design which will be the same as the original, but with an alternate base that’s probably made of PVC rather than the current bucket-o-concrete. For the record, I like the bucket-o-concrete, but some have raised concerns about safety. They’re afraid that people will hit their heads. 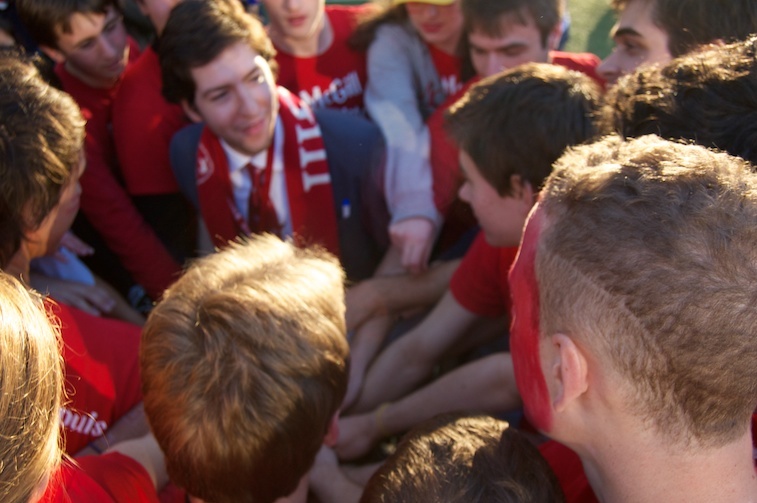 There were quite a few highlights for my time as a beater on the McGill team. I feel like our beaters really started to come together as a team this weekend. We had a rough start in our first game, and we were eliminated after we made it into the top 16 (the IQA hasn’t released final rankings yet) but I’m proud of my team and our performance at the World Cup. I think my favourite game was against “America’s Finest Quidditch Club.” As far as I understand it, by their own admission, “America’s Finest” was formed out of the desire of a number of jocks to beat up Harry Potter nerds. Partly because of their loose grasp of the rules of the game, America’s Finest played a very dirty game. I will not enumerate all the ways I saw them break the rules, but I will tell you that in the end justice was served: we won. We played a clean game and we still beat them. 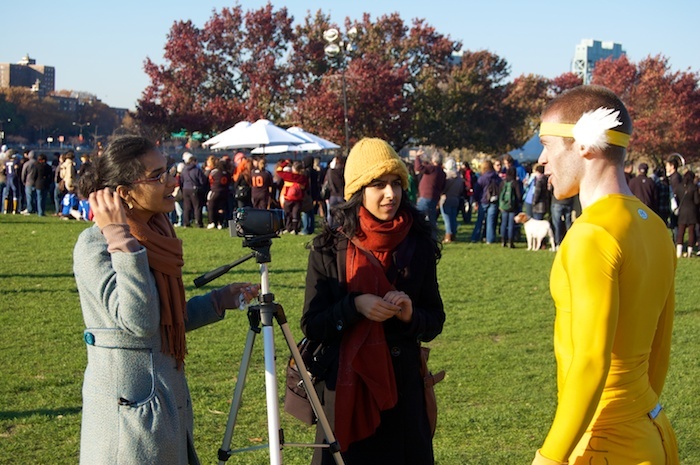 Being a golden snitch at the World Cup was a long-term dream of mine, one that I realised this weekend past at the Quidditch World Cup V in New York City. I had so much fun! On the first morning, Alex Benepe himself shook my hand and called me “Wings,” on account of the wings on my headband. A couple weird things to think about: Because of all those photos I took with those kids, I am in quite a number of people’s Facebook albums as the Golden Snitch now, I’m sure, and I will never be tagged, because those people don’t know me. Also, a surprisingly large number of photos were taken of my rear end. Speaking of my hindquarters, my performance as a snitch at the Canada Cup was recently featured on RelieFtv, a TV station in Ottawa. That’s the good news. The bad news is that the footage they have of me is mainly of me being pantsed by the University of Ottawa seeker. This Saturday was an exciting one for me and my teammates. I woke up at 5h15 to leave for Ottawa from the McGill campus by 5h45. 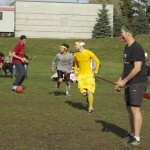 It was the day of the first-ever Canada Cup, and I was on the starting lineup for McGill’s quidditch team as a beater. That last point is a matter of some importance, actually. I believe there were six snitches at the Canada Cup, and three of those were McGill students. 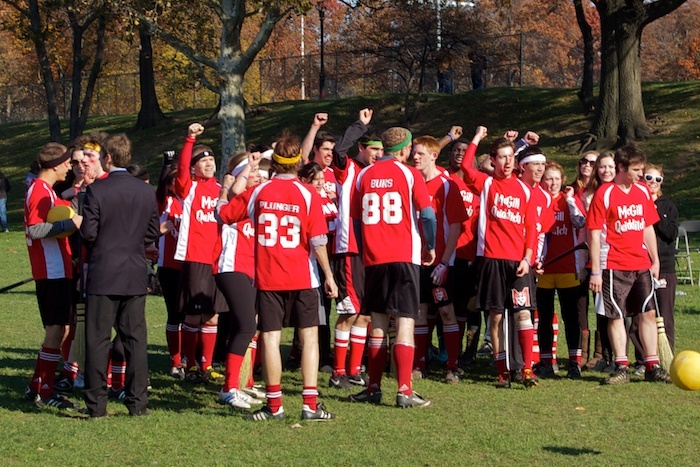 Because there were so few snitches, this meant that (contrary to tradition) a snitch from McGill had to snitch a game in which McGill was playing. Fortunately (?) in both cases where that happened, McGill didn’t catch the snitch, but the game was a blow-out, in that McGill had an advantage of greater than 30 points (the value of a snitch-catch) by the time the snitch was caught. I say fortunately, because it means that there’s no way that there could be accusations of favouritism on the part of the snitch. 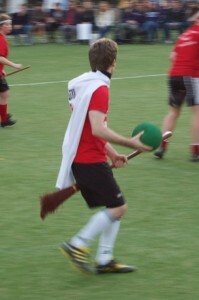 On Saturday, I realised a long-time dream of mine: I was the golden snitch for an actual competitive game between schools! I got to snitch two games, in fact. For the rest of the time I was busy beating for McGill. I had so much fun. I did make a mistake in my first game, though: Minutes before the game, I asked someone where the nearest bathroom was (because I had to go to the bathroom). This was a mistake because I did so within earshot of the seeker. Less than five minutes in, both seekers had me cornered in a bathroom, but fortunately they knocked me down when they forced the bathroom door open, and so I got a few seconds to run off. I lost them, hid, and came back to the field right on time. The second game that I snitched went much better. I colluded with the snitch from the other game at the time, and we both got in the car that we drove up from Montréal that morning and locked the doors. 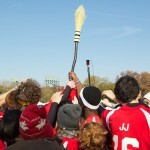 We took the car right up beside the quidditch pitch, and I leaned out the window and waved while he honked the horn. We waited for a minute while one more snitch jumped into the back of the car, then drove off into the sunset with the seekers sadly running after us. Eventually, after we lost them, we drove around campus for 7–8 minutes and then came back to the same parking lot where we started and got out and ran back onto the field. For this game, the seekers were little people! I felt bad for them whenever I would knock them down or steal their brooms or headbands. At first, the seeker from Ryerson caught me. 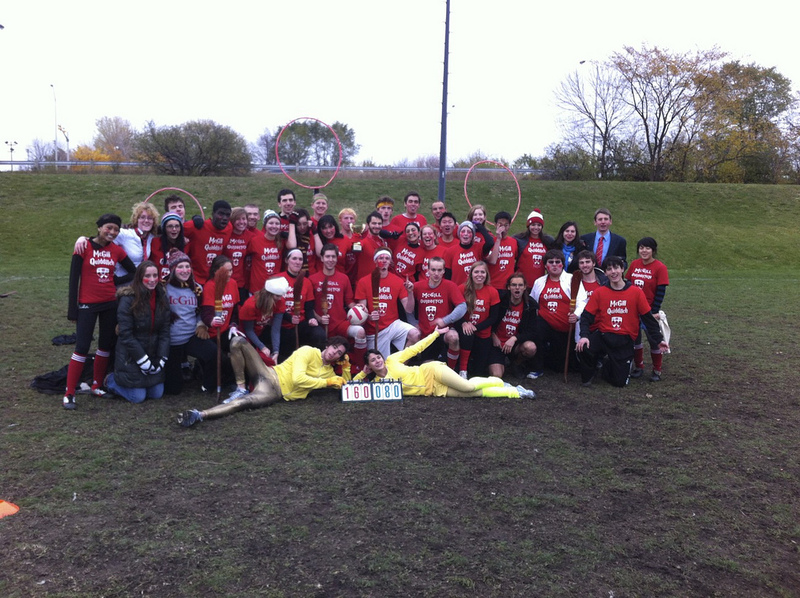 Ryerson was so happy—their team had never won a quidditch match before! 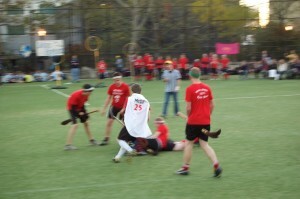 Alas, the snitch-catch tied the game and it went into sudden-death overtime. That means that game time is extended until a second snitch-catch, and the snitch doesn’t leave the field. U of T caught me the second time around, and they won. 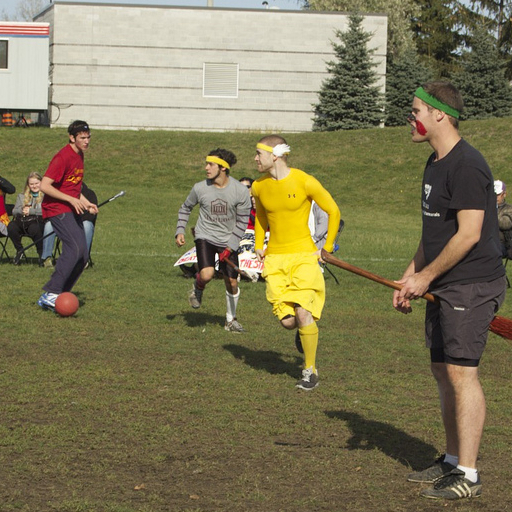 I’ve started noticing that I take on different personalities while playing quidditch, depending on what position I’m playing at the time. When I’m a snitch, I’m mischievous and playful. You can tell, because of the headband-with-wings that I wear. On the other hand, when I’m beating, I am very aggressive. I yell a lot and I pretend to be very upset about everything. That sort of thing. Also, when people break the rules, I yell at them too. That way, the other player has a harder time doing the “Oh I didn’t know I was hit!” thing. Also, sometimes the other player is honestly ignorant of a rule—I screamed my head off at a player who tried to continue to play, having fallen off his broom. I also yelled at a guy who tackled me from the back. Yelling is one of my favourite parts of quidditch. I love pretending to be really upset about stuff. I try to make it really over-the-top so people realise I’m not actually angry, but sometimes other players don’t get it. I made another beater really angry on Saturday. Oops! 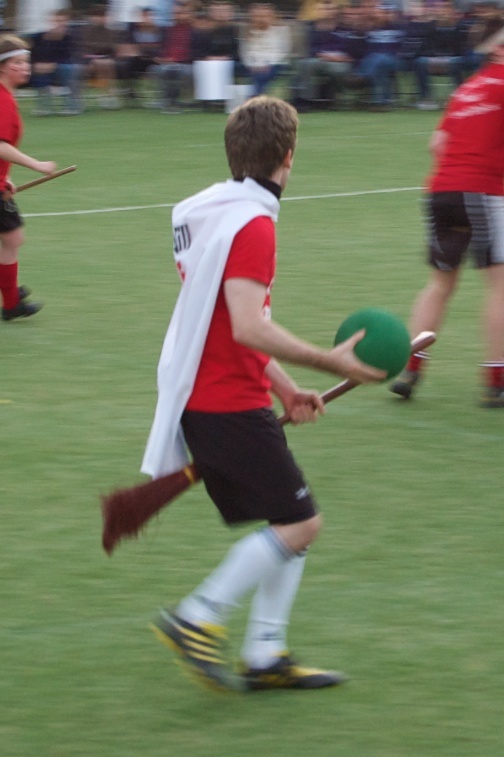 When I tell people that I play quidditch, sometimes I like to say that it only looks like we’re running along the ground with brooms between our legs when muggles watch, but really, we’re flying. Here are a bunch of photos from this Saturday past. I’m taking it as my project this week to try to come up with a better way to secure a hula hoop to its base for use in a quidditch game. 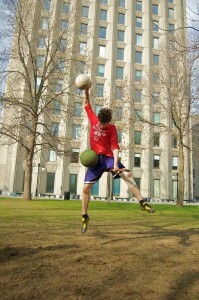 The weather was beautiful this Saturday past, and so of course, we played quidditch. For the first time, I got to be play as a chaser. Usually I’m a beater, which means that I throw the bludgers at people, which is very satisfying. Chasing is also satisfying, but in a different way. 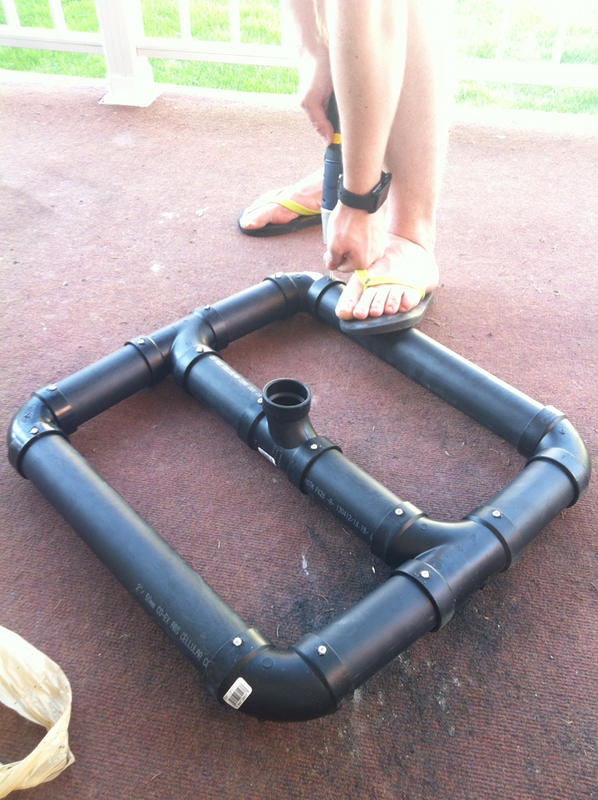 The goal of a chaser is to put the quaffle through the other team’s hoops. This means more catching and passing, which I’m not especially strong at, although by the end I was getting better than how I had started. It also meant more running and tackling—something I think I enjoyed just as much as bludgeoning other players with a bludger. My goal for next year is still to be a snitch, but I’m going to have to work on my endurance a lot to pull that off. I’ll also have to talk to the McGill snitch to see if she can give me some tips. That said, at least for summer practices, I think I’m gonna have some fun and try out all the positions. Except keeper. I’m not tall enough to be a good keeper. For me, the highlight from the World Cup was watching the brilliant performances of the Golden Snitches. These were some amazing athletes. I can think of no other sport where there is a position that combines long distance running, wrestling and acrobatic showmanship. There are few rules for the conduct of a snitch in a game. This means that the snitch can pull a seeker off his broom, interfere with players from another game, or wrestle a seeker to the ground, in an attempt to prevent the seekers from catching him or her. I have compiled a short list of some of the most entertaining things that I personally watched a snitch do in the course of a game. 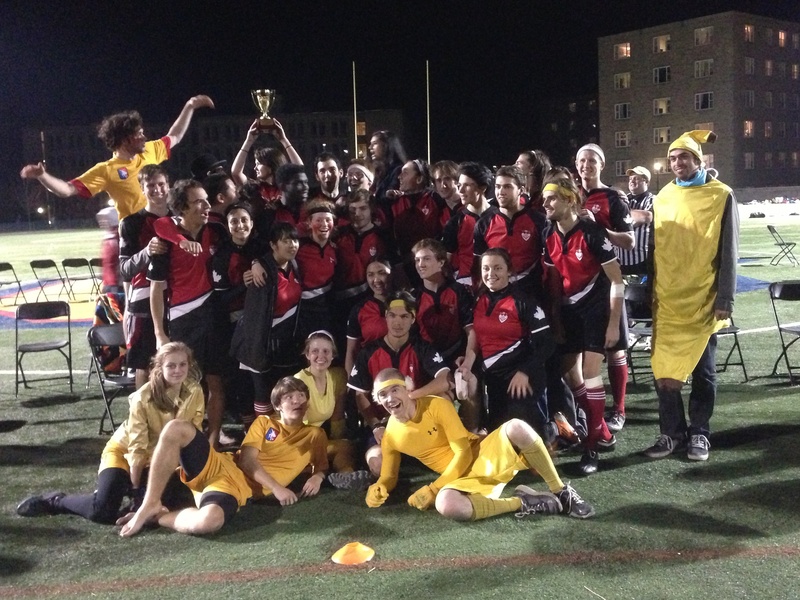 But my favourite moment was in the final game between Middlebury and the Tufflepuffs (the team from Tufts). For starters, the snitch for that game was brilliant. He could run faster backward than the seekers could run forward. He could flip a seeker on his back without losing his own momentum. It was amazing to watch. Toward the end, the snitch returned to the field, and with him came all the other snitches who had snitched the other games for the Cup. They arranged themselves around the real snitch, like a Roman Phalanx, so the seekers couldn’t catch him, and after a few seconds, they all ran around the field in a big blur of yellow, so it was impossible to tell from the sides where the real snitch was, and I’m sure it was equally confusing for the seekers, who were just returning to the field from chasing the snitch. Eventually, the false snitches left the field, and the snitch was caught by the Tufts team, but the playfulness and the athleticism of the snitches were really remarkable.